Follow these directions carefully for best results. You should begin to see improvements after 10-14 days of use. Wet your face, then take a small amount of Sakura Whitening Facial Cleanser into a lather in your hands. Gently massage into skin for 10-15 seconds, avoiding contact with eye area. Thoroughly rinse your face with lukewarm water. Dry your face by patting it with a clean absorbent towel. Use every morning and before bed. Saturate two cotton pads, wipe Sakura Balancing Toner Poresolution on your face and neck in the morning to remove sebum produced during the night and to balance your skin's pH levels. Also, exfoliate any remaining dead skin. Use at least once a day. Gently apply tiny dots of Sakura Luminous Complex all over your face and then blend lightly and quickly all over, allowing the serum to soak into your skin. Serum penetrates better when skin is clean, warmed and slightly moist. Serum provides extra nourishment to heal and strengthen skin. Use every morning and before bed. Gently apply Sakura Restorative Day Cream on face and then gently and evenly spread on your face and neck in upward and outward movements. It blurs away dark spots while nourishing your skin smooth and soft. Also, protect your skin with SPF 50 Broad Spectrum. Use every morning before sun exposure and reapply every 2 hours if it is necessary. Pump Sakura Cleansing Oil into dry hands and massage over dry face. Splash warm water onto skin and massage to help dissolve surface impurities and makeup. Repeat this process to thoroughly remove long-wearing makeup. Gently rub Sakura Gentle Facial Scrub in circular motions over your entire face to get rid of all dead skin. Continue to do this until you feel you have exfoliated every inch of skin on your face. Rinse the scrub off of your face with lukewarm water and splash face with cold water to close pores. Use 2-3 times per week. Toners with skin-repairing ingredients hydrate and replenish the skin's surface immediately after cleansing. They also help reduce redness and dry patches. Those with oily skin will see smaller pores. Daily use will give your skin what it needs to function in a younger, healthier way. Serums with antioxidants improve your skin in numerous ways, from reducing redness to stimulating healthy collagen production and improving the appearance of wrinkle. Immediately, your skin will feel smoother and look radiant. With twice-daily use, signs of damage will fade and your skin will look and behave healthier and visibly younger. 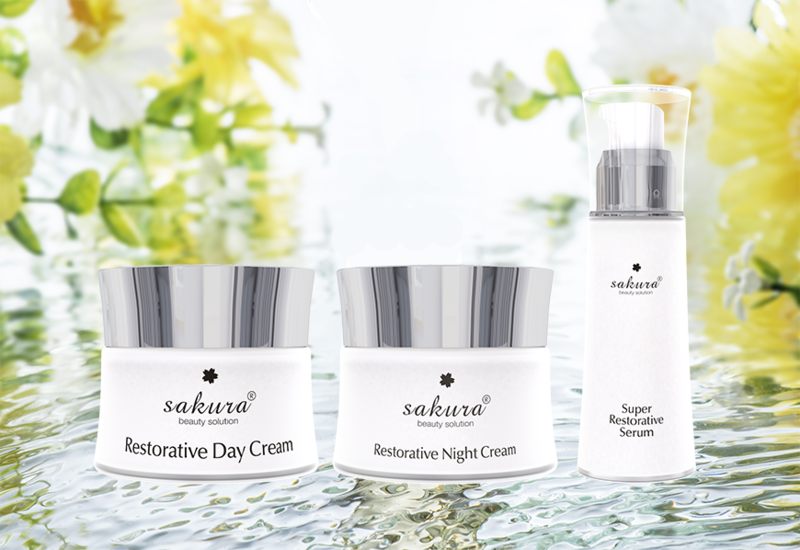 Sakura Restorative Night Cream Improve skin's healthy functioning and keep it feeling smooth and soft. Moisturizer for your skin type, you will see smoother, radiant skin that's hydrated and healthier. Dry, dull, or flaky skin will be replaced by skin that looks and acts visibly younger. Sakura Physical Daily Defense SPF 50+ PA++++ will protect you from UV rays and prevent skin damaged by the sun. An emulsion-type physical sunscreen with a safe sunscreen formula that enhances skin protection from sun damage. Suitable for daily use. Sakura Physical Daily Defense SPF 50+ PA++++ reduces the risk of irritation, supports the protection of the thin skin. Safety formula does not contain Silicon, Oil, and Mineral Alcohols. Instead of night cream, use Sakura Age Defying DNA Repairing Serum to nourish skin with antioxidants and repairing ingredients. Help regulate oily skin while nourishing damaged and aged skin to a smooth and youthful feel. Use 2-3 times per week overnight. Exfoliate with Gentle Facial Scrub before applying to face. Thoroughly wash serum off the next morning and proceed with the daily morning routine. This beauty supplement was formulated with advanced technology to prevent skin from aging and bringing back flawless, youthful and radiant complexion. This anti-aging formula is comprised of Collagen and Hyaluronic Acid to strengthen bones and joint health while improving skin elasticity. It is exclusively formulated with Sheep Placenta, for women aged 25 and older, to smooth out stretch marks and blur away wrinkles, for 10 years younger looking skin. It nourishes skin, improves skin texture, combats diseases, firms breast and relieves tension, for better sleep. This dietary supplement improves uneven skin and enhances skin moisture content by stimulating new cell production.